We have beautiful and tiny Teacup and Micro mini sized Tea Puppies for sale in California!!! 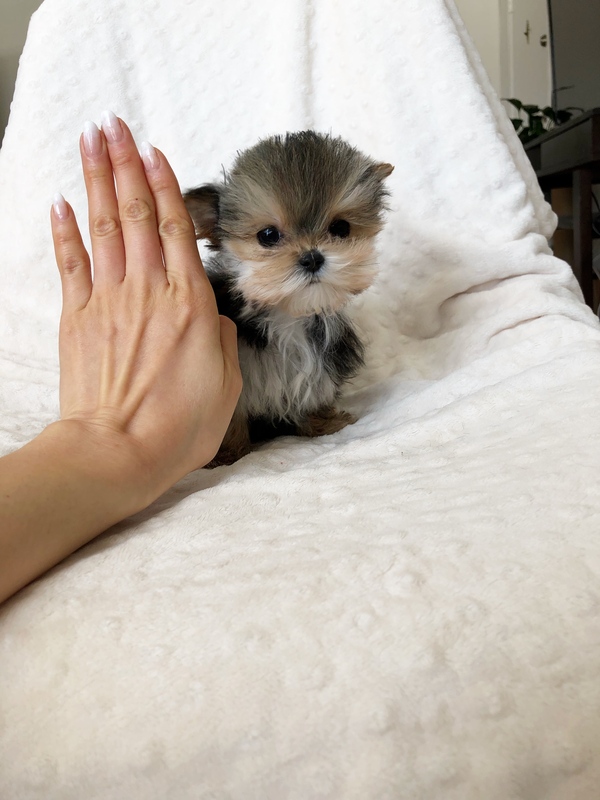 We specialize in tiny Teacup Yorkies, Teacup Morkies, Teacup Malteses, Teacup Maltipoos, Teacup Shorkies, Teacup Pomeranian and other teacup sized puppy breeds!!! We have the tiniest and custest puppies in Los Angeles! We also specialized in the itty bitty luxury purse pocket Micro Teacup puppies. Enjoy your visit at iHeartTeacups.com, Thank You! Micro Teacup Tcup Yorkie Puppy-COBBY XTREME!! This is Mimi; the cutest tiniest little Yorkie. She will melt your heart She is 19 weeks old and 20 oz. She is going to be a very tiny little girl when full grown. She is extremely tiny (pictures don’t show how tiny she is) but don’t her size fool you, she loves to play! She has gorgeous eyes, tiny ears, thick beautiful coat, short tiny nose and a very healthy appetite for his micro size. She literally fits in the palm of your hand. She is a quiet puppy, and very sweet and mellow. She is up to date on shots and is ready for her new home. She will best fit in a home with no younger children or large animals. If you’re interested you call 805-613-7868 or email us at: iheartteacups@gmail.com (SERIOUS INQUIRIES ONLY) Thank You! CLICK HERE FOR MORE PICTURES! Make an appointment with us to come and meet the teacup puppy of your dreams!!! ATTN: Must be 18 years or older to inquire about a puppy. Also, we do not have any puppies in the $500 price range for sale. Please note the price of the puppy listed in the description before you inquire. Thank You. SERVING ALL OVER THE USA. LOS ANGELES, CA FOR LOCAL PICK UP. Shipping Available within the US and Canada and nanny service available to other countries.